Cajun spices, sweet red chilies and natural Root Beer extract (we don't use soda so we control the amount of sugar added). You can actually taste the anise, wintergreen and all the herbs used to make real homemade root beer. It has a tomato base and is similar to a barbeque sauce. 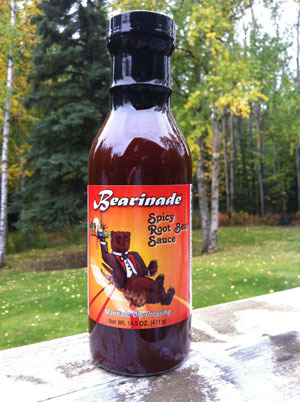 This sauce great for chicken, ribs, pulled pork and anything you want to throw on the grill. It is fantastic as a salmon glaze or a cocktail sauce for shrimp but in our house it gets the most use as a dip for sweet potato fries.